AMMAN – The discovery of a 6,000-year-old statue in the Northern Badia sheds new light on a little-known ancient bedouin civilisation that once thrived in the region, according to archaeologists. The discovery of a small basalt statue, announced by the Department of Antiquities (DoA) on Tuesday, dates back to the Late Chalcolithic/Early Bronze Age, between 5,500 and 6,000 years ago. 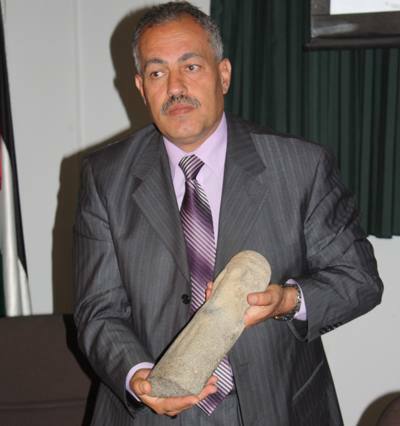 The 35-centimetre-high statuette, nicknamed “Dalish”, was recently uncovered by a joint Jordanian-German team near the Jordan-Saudi border, some 130 kilometres east of Al Jafr, according to the DoA. The statue, which has a long nose and a bearded, abstract face, adorned a burial cairn, a mound of stones marking a burial site from the Late Chalcolithic era. Experts believe that hundreds of such burials were left behind by the nomadic and semi-nomadic prehistoric communities that once roamed the eastern desert. The finding marks one of the most complete artefacts from the time and is a rare depiction of the daily life and culture of the Badia’s early inhabitants. Grooves on the statue indicate that residents at the time wore the dishdasha, indicating that the Arab garment dates back to over 6,000 years, the department said. The joint team, led by Hans Georg K. Gebel of the Free University of Berlin and Mutah University Professor Hamzeh Mahasneh, also discovered the head of a second statue made of sandstone near the same burial cairn, according to the DoA. For four years the team has been working in Qulban Beni Murra in the Hamad, a stretch in the northeastern Badia which is home to extensive burial cairns and other remnants from ancient bedouin life. At a press conference to announce the finding yesterday, DoA Director General Ziad Al Saad called the statue an “important discovery”. “We have new discoveries daily, but one such as this is important and tells us more about our culture and history,” he said. He pointed out that the Northern Badia, in addition to its early Islamic desert castles, is home to a wealth of prehistoric sites that still need to be identified, protected and promoted. “It is important for us to focus our efforts on the eastern desert, from which this discovery shows we still have much to learn,” he added. Over the last three decades, there have been several surveys of prehistoric settlements in the northeastern desert, which was once part of strategic trade routes running from the Arabian Peninsula to Basra and Damascus. With seasonal water sources, the area has been home to nomadic and semi-settled peoples for thousands of years and is believed to have served as a link between ancient Mesopotamia and Pharaonic Egypt. Due to the remoteness and harsh desert conditions of the region, however, the Northern Badia is difficult to survey and monitor, according to archaeologists, who believe there is much left to be discovered about the earliest bedouins.